Sandy shores can be found around the world on places where the velocity of the water inhibits the finest particles to settle on the bottom. Sand is heavy enough to settle on these places. On places with even higher water velocity one can expect only gravel or pebbles to settle on the bottom. In some oceans sand can be found at greater depth. It is thought that in these oceans the sea-level raised on a geographic timescale submerging the old sandy coastline. On exposed coasts wave action will favour formation of beaches whereby severe wave is mostly associated with steeply sloping beaches of coarse sand whereas broad flats occur in areas with little wave action. Beaches mostly appear devoid of life because animals live inside the bottom to survive the unstable enviroment. Relative few species are adapted to live to the difficult conditions of moving sand grains. As a result the number of species is generaly low though often a species occurs in great numbers. Plant life is restricted to microscopic algae (diatoms) living just at the surface or in the body of seawater above. On more stable sand or pebble bottoms life is more abundant and more orgasnisms will live on the surface. On open sand beaches large plants are absent. As a result the animals living on the beach mostly depend for their food on the seawater. The most common animals are clams which live in the sea bottom. They obtain their food by filtering plankton or organic particles transported in the seawater. Because of the wave action organic particles usually aren't deposited on the sea bottom. But some do, providing food for polychaete worms and, on some parts of the world, for sand dollars. Beaches don't provide much food for carnivores. 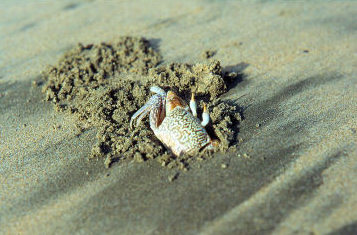 But some scavengers like crabs, starfish and gastropods will survive. On more protected places microfloral films and some macroalgae may be present. But even the latter do not appear to be grazed quite often; mostly they are broken down to detritus. Clams, which live on suspended food particles, are very common here as well. 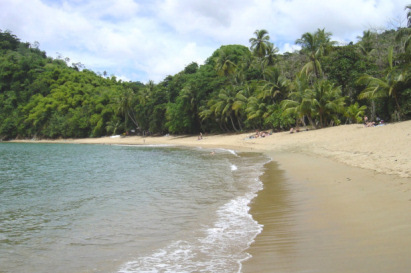 The restricted water movement on protected places increases the chance that organic particles will be caught in the sand. Therefore detritus feeders, especially worms, are more abundant here then on beaches.